There’s little more than ruins left of most Roman temples. A few columns, maybe. Here and there some stairs or maybe even a wall remain, crumbling. 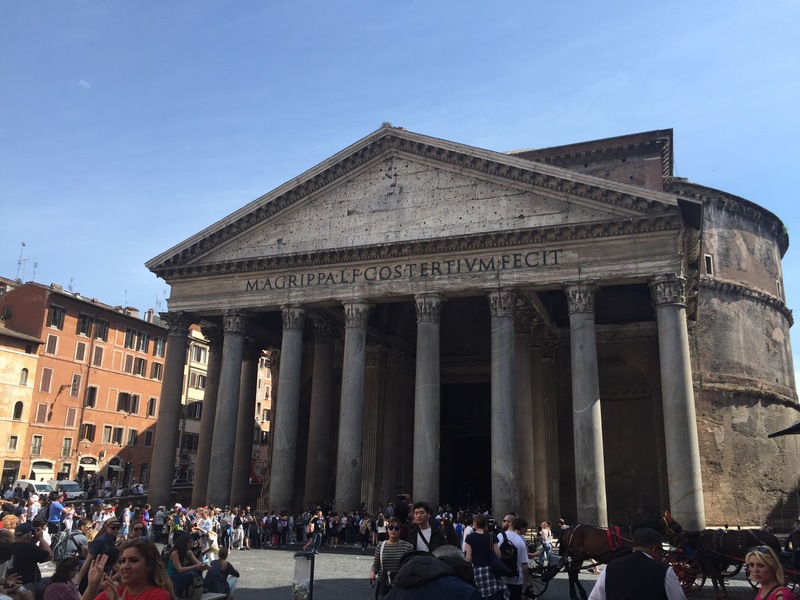 But the Pantheon is not only still standing, it’s flourishing after 1890 years (of course, not still in it’s capacity as a pagan worship site). 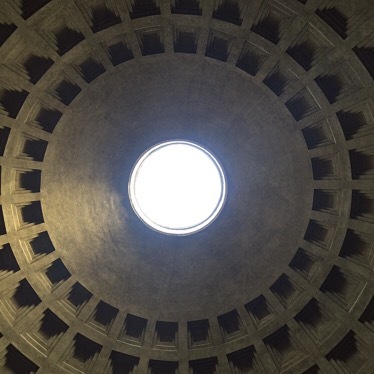 Built by the Emperor Hadrian, the Pantheon had a highly atypical design for its era. 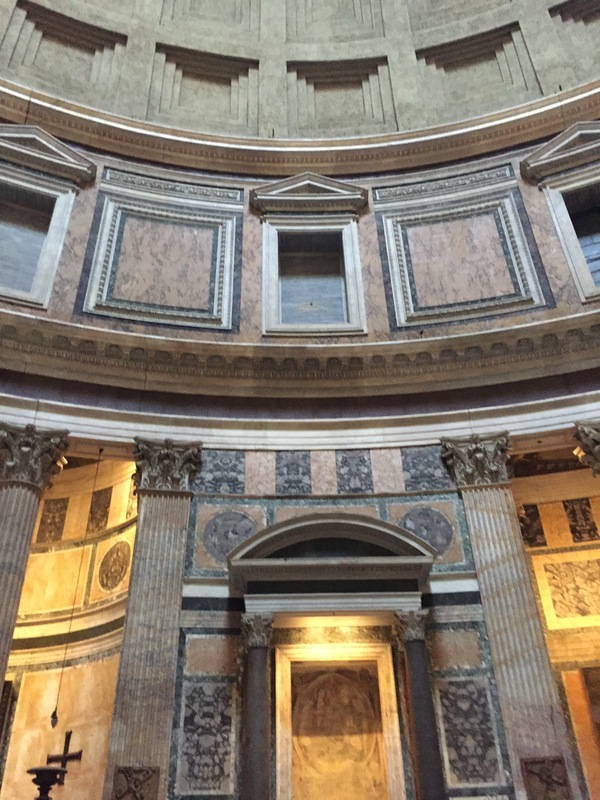 Unlike the typical, squarish Roman temples, the Pantheon (so named because it was dedicated to the entire pantheon of Roman deities) consists mainly of a large, circular room with niches set in the walls. An round opening, or “oculus,” lets sunlight into the room through the center of the domed ceiling. Yes, a staffer assured us, rain does in fact pour through the roof. This opening makes up for the lack of windows elsewhere in the temple. 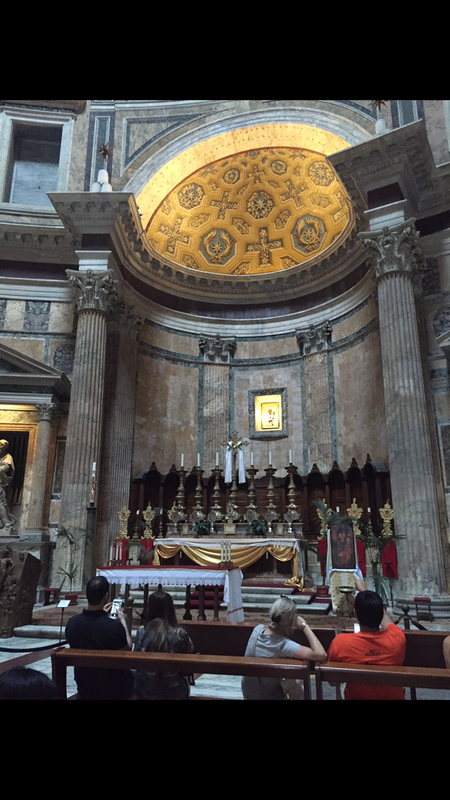 As is true with many of the better-preserved Roman temples, the Pantheon was long ago converted into a Roman Catholic church. The Eastern Roman Emperor Phocas gave the Pantheon to the Vatican in 609 A.D., with instructions to convert the building into a church. Coincidentally, Phocas also commissioned the last addition to the already falling into disrepair Roman Forum, the Column of Phocas. The Renaissance artist Raphael is also interred in the Pantheon, although I learned this fact at the Vatican after visiting the Pantheon, so I didn’t see where this was. Tip for other travelers: while the restaurants in the piazza directly in front of the Pantheon tend to be more touristy and pricier, if you face away from the Pantheon and walk down either of the the roads directly in front of you (I recommend the one on the right), that will take you to a part of town with cheaper restaurants and less tourists. There’s also a little bookstore or libreria down that way that, sadly, was closed the day I finally made time to visit it. The area in front of the Pantheon is a bustling courtyard full of shops and restaurants.